Maybe students won’t learn about global competency until when they’re older, but it’s too late by then because they don’t have the language and vocabulary of how to approach people different than them. Macias Morris’ journey into Spanish immersion teaching began in Chile after completing her undergraduate degree. Through a program with English Opens Doors, Macias Morris spent seven months teaching English in classrooms from first to 12th grade and even coached a winning debate team. She lived with a host family, with whom she stays in touch. One of Macias Morris’ host sisters even attended her wedding. She remembers getting to meet people and learning their stories, cultures and food. Macias Morris remembers the Spanish being different than what she learned growing up in a Mexican-American household and in college, describing it as a little slangy. The Peruvian influence in northern Chile fascinated her in particular. 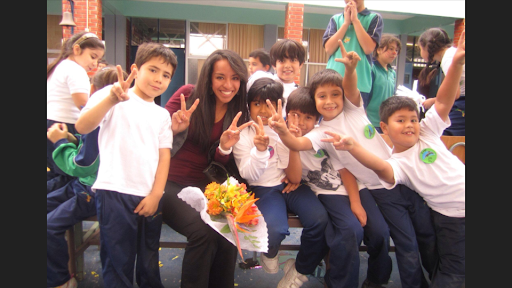 Her time in Chile helped her fall in love with teaching in diverse communities. After her English Opens Doors program ended and she spent a year co-teaching in Spokane, Wash., Macias Morris found that the University of Washington’s teacher preparation program offered an ideal pathway into the profession. At the UW, as part of her student teaching, she was placed in an immersion program in a local school because of her ability to speak Spanish. Her plan was to complete the year, then move into a traditional classroom. “I got into that fourth- and fifth-grade classroom and fell in love with teaching in my native language,” said Macias Morris, who received the UW's Ferguson Endowed Scholarship. Macias Morris actually stopped speaking Spanish while she was in middle school. She didn’t want to stand out, and other kids just didn’t speak other languages. She says a big part of continuing with immersion teaching comes from wanting to motivate children to speak Spanish comfortably. She also wants to integrate global competency for her students and let them know what other kids their age are going through. As a teacher at McDonald International Elementary School, a public immersion school in Seattle, Macias Morris grew to appreciate how much she gets to learn from her students. One classroom activity involved students creating family trees at home and sharing their backgrounds. She had her mother and some of the students’ parents visit the class to speak about their personal histories, particularly their journeys to the United States. She said students wrote letters about what they learned to help them be more open to others. This type of teaching, she says, is helpful for not just the students but also the parents as they see what’s going on and how they can speak with their kids at home about immigration and what’s going on in the world. When Macias Morris completed the application for the NEA Foundation Global Learning Fellowship, she did not truly expect to receive the “congratulations” email two months later. Macias Morris is now a 1st grade Spanish immersion educator at the Libby Center in Spokane Public Schools. Being named the 2018-19 Global Learning Fellow for Washington state will allow her to collaborate with teachers nationwide who are both like-minded in the importance of global competency and open-minded about incorporating it into their classroom practice. She is excited to better integrate global competency in her community, but she also just wants to let others know it’s possible in the classroom. Next July, Macias Morris and Global Learning Fellows from across the U.S. will travel to South Africa for a nine-day field study. Traveling from Cape Town to Johannesburg, the group will visit several schools and museums, meet up with teachers and local residents, and learn about apartheid in a whole new way following the centennial of Nelson Mandela’s birth. Through the fellowship, Macias Morris will gather more ideas to guide her students to be global citizens while also creating an environment where differences are not just welcomed but celebrated. Learning about her Hispanic heritage while teaching in her native language pushed Macias Morris to take pride in her own identity and explore the world around her more deeply. She embraces the opportunity to travel, learn about other cultures and return to share the world with her classroom.